Auckland may not endure sub-zero degree temps, nor will we ever know the nose-numbing pain of commuting through sleet and snow, but, we do love a themed pop-up. 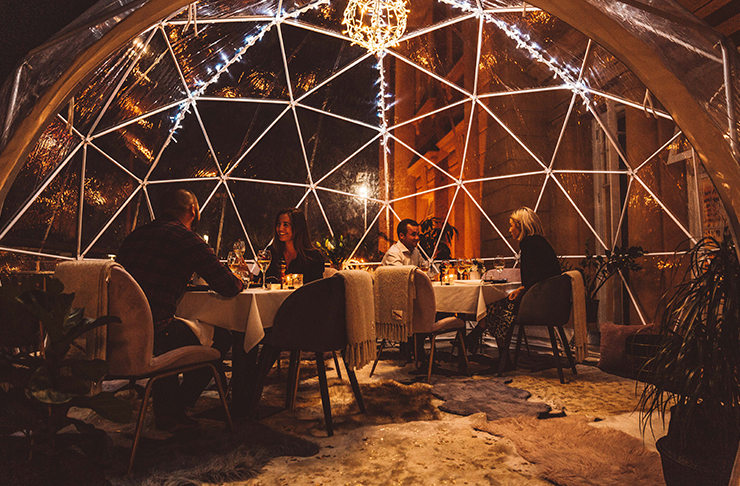 Popular restaurant Harbourside has installed an igloo on its terrace for the cooler months. But this isn’t just any igloo—think a chandelier, fairy lights, floor rugs, heating and comfy dining chairs. Hungry? Diners can enjoy a four or eight-course degustation while gazing at the stars. Devour freshly shucked Bluff oysters, sashimi and sushi, grilled Queensland black tiger prawns and grass-fed eye fillet. Then, wash it all down with a wine match. The eight-course degustation is a seafood lover’s dream come true. Oysters, clams, paua, John Dory and snapper are all on the menu until the end of May. For dessert, there’s white chocolate cheesecake served with mixed berries, raspberry gel and sorbet lemon foam. Drool. The Dining Under the Stars experience at Harbourside is only available until the end of July and bookings can be made for groups of four or up to eight people.